Digestives are, to me, a quintessentially British invention. They’re sort of a scratchy hybrid of cookie and cracker often sold at U.K. import shops, and they typically pair well with a lovely cuppa tea. London Drugs continues to confuse and delight me. Their food section feels so beautifully random: an assortment of household basics with more eccentric choices, like fizzing Japanese soda candy and oddball English potato chips. In fact, there’s a whole lot of British at London Drugs. (For a bit of a history lesson on London Drugs, check out their website.) It’s not as grand a place as my favourite local British import shop, British Pantry, but it’s nice to have U.K. sweets as an option at a mainstream Canadian retailer. And what selection of British snacks would be complete without digestives? 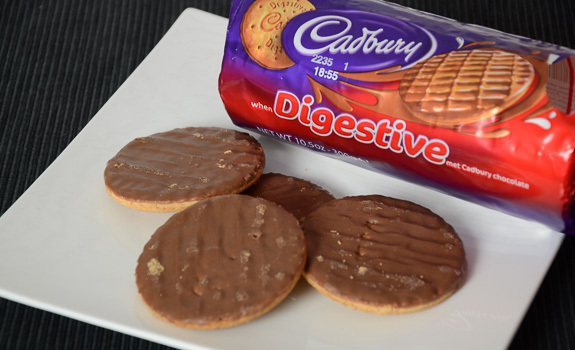 The Pitch: “When Digestive met Cadbury chocolate.” “Digestive biscuits half covered with milk chocolate flavoured coating.” Any time I read “milk chocolate flavoured coating,” I get nervous. Note, of course, that there’s no need to define what a digestive biscuit is on the label. That would be like a Canadian box of cookies having to explain what a cookie is. The Look: One side is a wheaty-looking circle, while the other is coated in chocolate, presented on the biscuit with a lined pattern. The package – a cylindrical stack of digestives, wrapped in plastic – is basic but only somewhat functional. 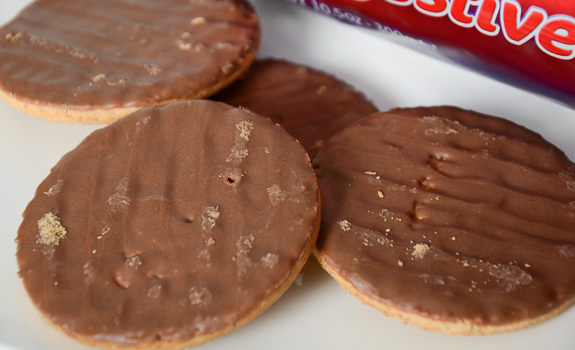 If the biscuits have only travelled from the cornershop to your flat, then it’s probably fine; but the thin plastic film does little to protect the crumbly cookies when they make the trip abroad. The Taste: The biscuit base is rough and not overly sweet. It tastes like it’s at least somewhat nutritionally beneficial, though I have no reason to believe it is. The texture is scratchy but dissolves quickly once it touches moisture. The closest Canadian/American equivalent I can think of is the graham cracker. The “milk chocolate flavoured coating” is sweet and smooth, if somewhat lacking in character, and compensates for the crumbly, salty biscuit. Note the pattern on the top of these Cadbury Digestive cookies. There’s quite a bit of milk chocolatey coating on every one. Cost: $2.75 for a 300 g package at London Drugs. Availability: Not entirely sure. Try shops that carry UK import food. Nutrition? : Per 2 cookies (33 grams): 170 calories, 8 grams of fat, 100 mg of sodium, less than 1 gram of fibre, 2 grams of protein. The verdict: Pour yourself a cup of tea, crack open a package of chocolate-coated digestives, and have a lovely afternoon treat while leafing through The Guardian. Them out of low grade crap it’s very obvious. I won’t be buying them ever again. They are atrocious.